The reasons for logging your amateur activity fall into three categories: legal, operational and personal. Legally, a log of your transmissions would be invaluable in proving your innocence in an interference complaint. Operationally, having a log of past contacts is a resource when filling out that DX QSL card that may have taken months to arrive. Personally, a log is like a personal radio history reminding you of the people and places you’ve talked to, the nets you participated in and contests you worked. There are two essentials types of information that every log needs: Information about your operation and information about the station you contact. For your operation record the date, frequency, mode and power output; for the contact station record their call sign, the time the contact started and ended, their signal report, name and location (QTH). When you enter the date and time, Universal Coordinated Time (UTC) or Zulu as it is commonly called, is highly recommended. Using UTC eliminates confusion over time zones or daylight saving time, but you must remember to change the date at 0000Z, which could be anywhere from 4 PM to 7 PM local standard time for a North American station. This is an advantage of the computerized logging programs. They keep UTC date and time straight automatically. Of course, you are free to use local time as long as you indicate this clearly in the log. It is unwise to mix UTC and local times and dates together in the log; use one or the other. If logging manually during a contest, it is impractical to record the start and end times for each station so these log areas can be used for contest-exchange information. The hardcopy paper logbook is the traditional keeper of the contacts. The format of your log can be your own personal preference. By using a common composition book with bound pages, you can add information in the order that makes sense to you. 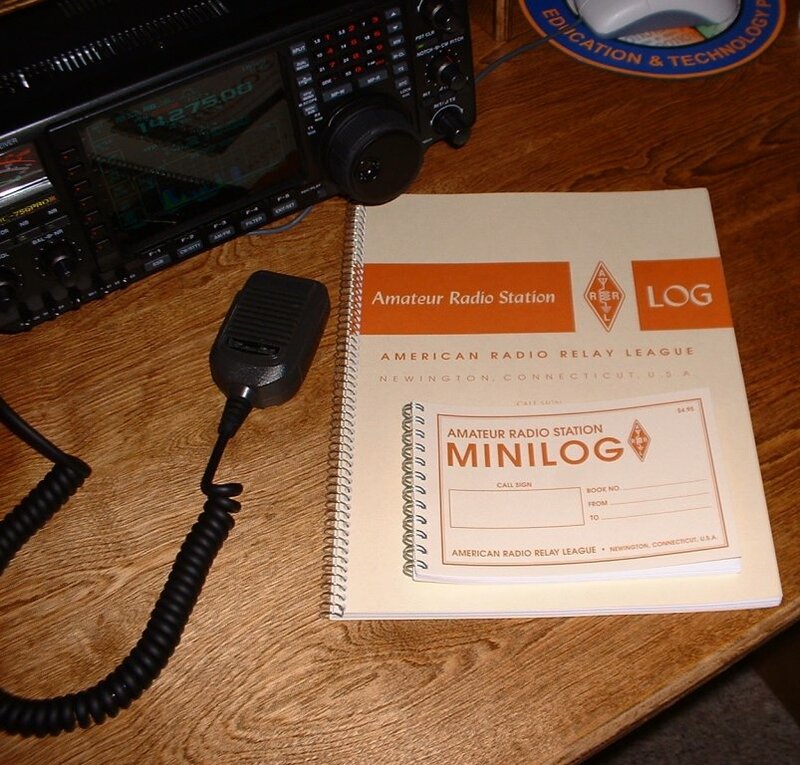 Here is a sample log sheet format you can download or you can buy the ARRL Logbook. A number of computer logging programs are also available. 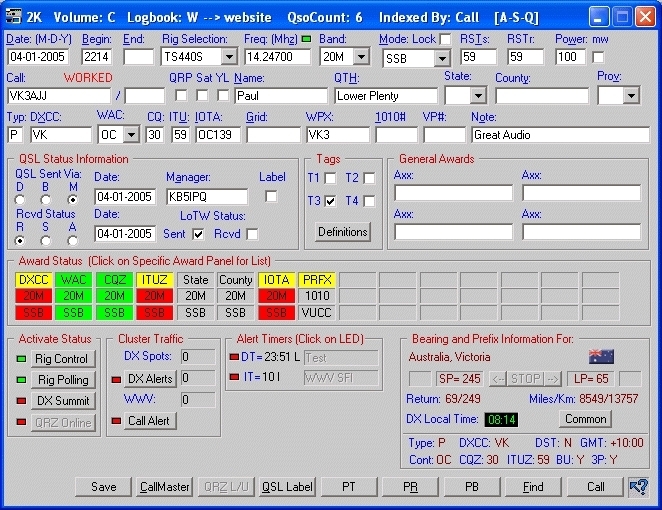 Computer logs are configurable and can automatically keep track of a wide range of information. Many include tools to control modern software controllable rigs. Rotor control is also available with some and many will automatically generate a great circle map from your location to any other point on the globe. Time and date functions for UTC, local and daylight savings are standard but you can also find computer loggers that will display a gray line diagram for helping to plot propagation. There are also a number of logging programs available that are designed specifically to help you during contests. Some are general contesting programs that record generic points and multipliers while keeping track of the basic information. Others are designed with specific contests in mind and aim to help you maximize your score. There are even some that are general contest loggers that have plug-ins available for those contests you are interested in. Contesters almost always use computers to log. Finally, many computer logs support an export function that makes sending your log in to Logbook of The World (LoTW) fast and easy.